Is motorcycle lane splitting legal in Delaware? ?What do I do at the scene of a motorcycle accident? Maneuvering one's motorcycle between slow-moving lanes of traffic, commonly known as lane splitting, is a popular practice among motorcyclists. However, while lane splitting is only explicitly legal in California, most states—including Delaware—don't address the issue at all in their code of regulations, making the practice technically legal by default. According to one U.C. 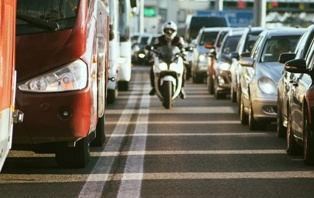 Berkeley study, lane splitting is a factor in nearly one-fifth of all motorcycle accidents. Motorists failing to watch for motorcyclists is a common cause of motorcycle accidents. Since motorists do not always think about sharing the road with motorcyclists , they don’t expect motorcyclists to pass them in slowed traffic. Fortunately for motorcyclists injured in crashes caused by a motorist's negligence, failing to see a motorcycle doesn't absolve drivers from responsibility for accidents and injuries. Sadly, in some instances, motorists may claim that a motorcyclist's lane splitting was the true cause of an accident. When this happens, it's extremely important for motorcyclists to have knowledgeable and experienced legal representation. If you were injured in a motorcycle accident involving lane splitting, the seasoned motorcycle accident attorneys with the Morris James Personal Injury Group can investigate your case, help you understand your legal rights and options, and fight for the compensation you deserve. Do you have questions about a Delaware motorcycle accident? Contact us today to schedule a free initial case consultation. Act now, as the time to file a motorcycle accident lawsuit is limited.